Amazing & Powerful Machines Of Modern Technology! - Muscle Cars Zone! Amazing & Powerful Machines Of Modern Technology! Technology is constantly on the rise and because of that we constantly get to see various powerful machines being released. These new mighty machines are making all of our lives easier and help us finish our tasks more efficiently. However, in the video below we will be mainly focused on the construction and agricultural industry. In the video below you`ll get to see a compilation of various amazing machines performing their assigned work. You`ll get to see awesome road vehicles, huge trucks, SUVs and other forms of machines. Among them, you`ll mainly see modern technology. However, you can also see older machines that managed to beat every test time threw at them. In the first vide you`ll get to see two trucks towing a gigantic trailer. One of the trucks is at the front of the trailer and the other at the back to assist with steering. 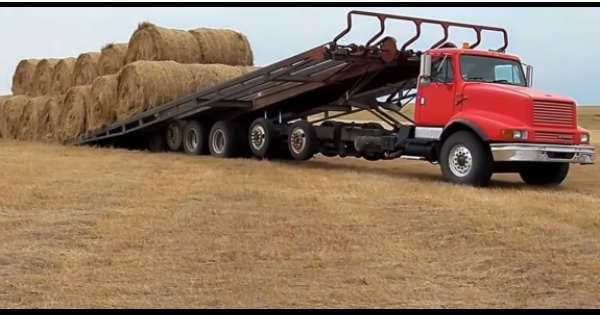 Yeah folks, imagine how big that trailer is when you need two trucks in each side to handle it. Next, you can see how the road constructing technology works today. You can see powerful machines like road pavers, paving a road in a very short amount of time. This is all very expected because the road construction industry is one of the oldest when it comes to construction. Next we move to the amazing machines of today in the agricultural industry. Huge combines working the soil like a boss. Human kind has surely evolved a lot since the time we used horses to work our soil. Finally, click here to witness one exciting battle between machines and nature!